This award-winning adaptive software generates study material paired to your specific knowledge gaps, while real-time algorithms ensure every minute of study time is optimized along the way! 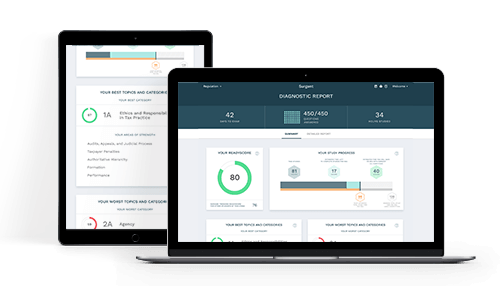 A groundbreaking CPA Exam readiness tool, ReadySCORE, is proven to be accurate within 4% of real CPA exam scores*. Our data-driven approach to exam prep helps you study more confidently than ever before! What other course gives you this level of transparency into your study performance? 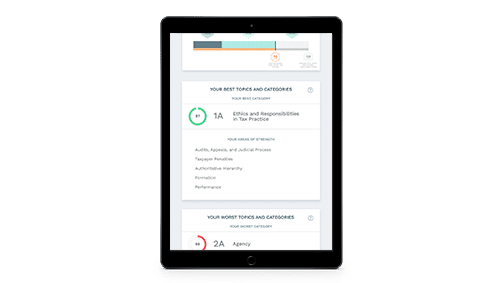 Only Surgent’s software features in-depth performance reports to show you your performance by topic, how you stack up against other candidates who have passed, and the estimated time required to complete your studies. Passing the CPA Exam is difficult. That's why you need the review course that actually makes studying easier! Try Surgent CPA Review for 5 days! Just fill out this short form and we'll email you a link to start your free trial. In fact, the average student’s ReadySCORE improves 97% while studying with Surgent. With Surgent, you'll enjoy unlimited course access until you pass. And we'll automatically update your online course content whenever the exam changes. In fact, all of our courses come with a pass guarantee. Plus, 350+ bite-sized video lectures, 7250+ multiple choice questions, and nearly 400 simulations. Our students benefit from access to phone, email, and online support, as well as dedicated CPA Exam Success Coaches.